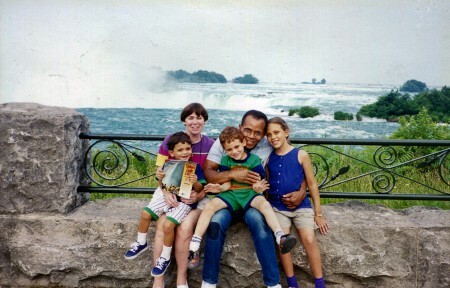 About twenty years ago, a long time and much loved friend, living in upstate New York, invited me and my family to visit her. She was planning a trip to Niagara Falls and asked us if we would like go. The thought of traveling all the way to New York and then to Canada had Sarah, Jason and Michael on the verge of hysteria. “Dad,” Jason said, “that is the biggest waterfall in the world, we gotta go.” His sister and brother were equally as excited. Tricia and I were also excited by the thought of spending some quality time with a friend that we had not seen for a while. So, on the following weekend, off we went. We spent a whole day viewing the falls from both the U.S. and Canadian sides of this spectacular display. I came away believing that we had experienced one of nature’s most magnificent plunging water displays. For the 20 years since that visit to Niagara Falls, I have held a belief that all other waterfalls in this part of the world would be, at best, somewhat of a disappointment when compared to Niagara. I figured that my next waterfall experience would have to be something like Victoria Falls in Zimbabwe, Africa, or Angel Falls in Venezuela. Two weeks ago, however, I discovered that I have, unfortunately, been “stuck on stupid” for the past twenty years. Recently, I drove north toward Norfolk, which is on the Massachusetts border, to visit Haystack Mountain State Park to capture some sunset photos from the top of a 34-foot stone tower at the summit of Haystack Mountain. I could get photos of the Berkshires in Massachusetts and the Green Mountains in Vermont. 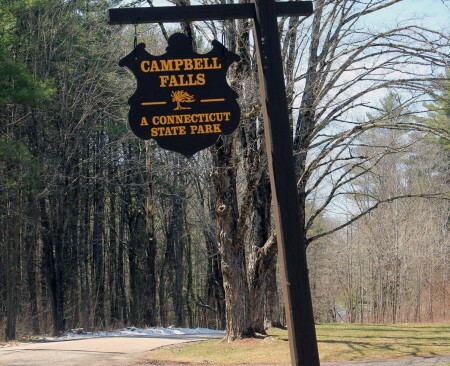 As I entered Norfolk I saw a sign indicating that Campbell Falls State Park was just 2 miles north on the same road. 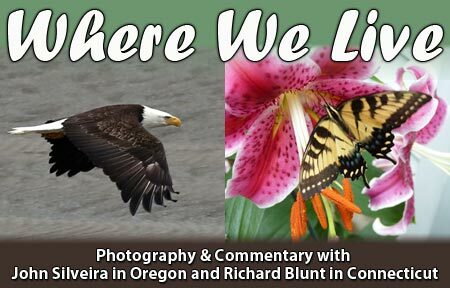 Recalling my wonderful experience at my last visit to a waterfall, I changed my plan and headed for Campbell Falls State Park. 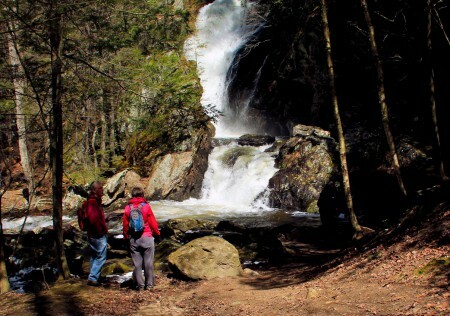 I figured if the falls were a disappointment, I still had Haystack as a Plan B.
I entered the park in Connecticut from a small parking area off Toby Hill Road, and followed the yellow blazes on the trees to the falls. The park consists of two acres in Connecticut and four acres in Massachusetts. Over the years the two states have managed the park through an informal agreement with great success. The grounds and trails were free of the litter that I often find in some parks. 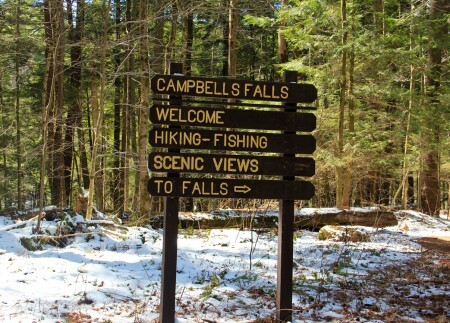 Campbell Falls is one of New England’s most popular natural attractions. 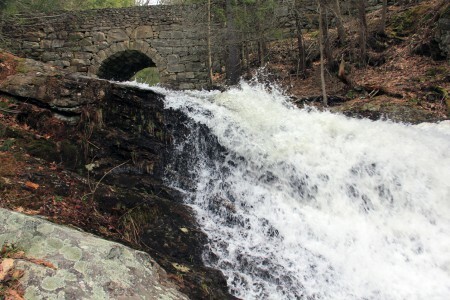 This spectacular display is created as the Whiting River drops over a two-step fall, first in a veiling horsetail which begins wide and constricts as it rushes 41 feet into a narrow recess. It then slides down a rugged sloped bench for another 7 feet to a shady glen below. 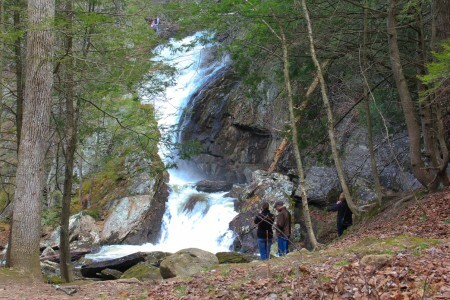 The base of the falls is about 250 feet north of the border between Connecticut and Massachusetts. As soon as I stepped out of my car I felt a stiff northwest wind howling through the tall white pines. This chilling wind failed to drown out the faint thundering of the distant falls about a half mile away. As I proceeded down somewhat slippery, snow-packed trail, the roar became more distinct and louder. I started to experience an excitement similar that of Mickey Mouse in the Walt Disney movie Fantasia. Mickey portrayed the young apprentice of the sorcerer Yen Sid in the 1940 animated film. He tried to master the sorcerer’s tricks, but soon discovered that he couldn’t manage them. As I approached the falls the majestic site of this thundering plunge of water, unlike Mickey, I quickly realized that the power of nature, not sorcery, was in charge here. My brief fantasy had ended. What a relief. 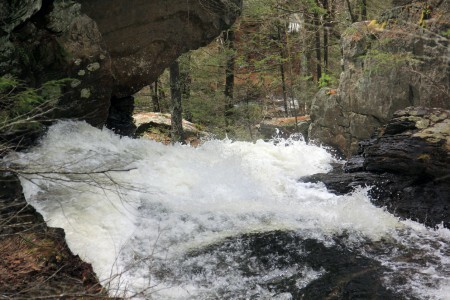 The path (marked with yellow blazes on selected trees) goes into Massachusetts and back into Connecticut before reaching the falls. 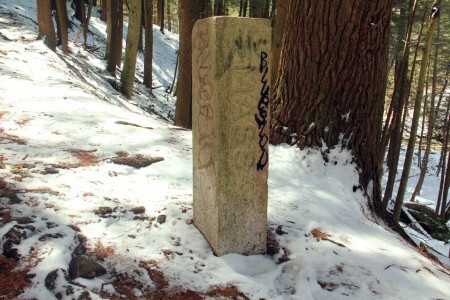 As I approached the steep downhill path to the falls, I saw a concrete column marking the border line between the states. 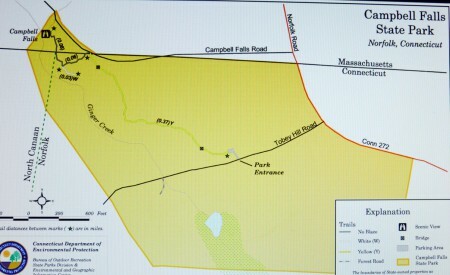 My map indicated that the road next to the column was Campbell Falls Road. Following it a short distance brought me to a massive stone bridge at the top of the falls. Viewing the spectacular plunge of the falls from this bridge was love at first sight for me. I had to see the falls from the bottom so I headed back up the road to the trail and slowly made my way down. It is only 62 feet from the top to the bottom of the falls. This isn’t spectacular when compared to Niagara’s Horseshoe Falls on the Canadian side. But most of the enjoyment Campbell Falls offers is the ability for a viewer get close enough to the falling water to feel the power and hear the thunder at both the top and bottom. Usually, I avoid climbing over wet, slippery rocks and down steep, snow-packed trails with expensive camera equipment. But, like the sorcerer’s apprentice, I couldn’t resist. 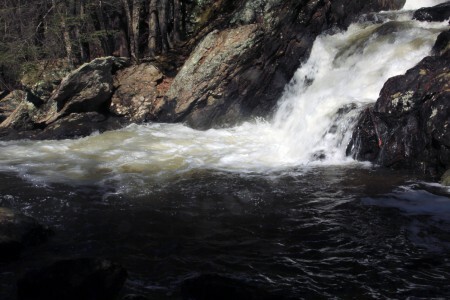 At the base of the falls is a quick moving stream — Ginger Creek. 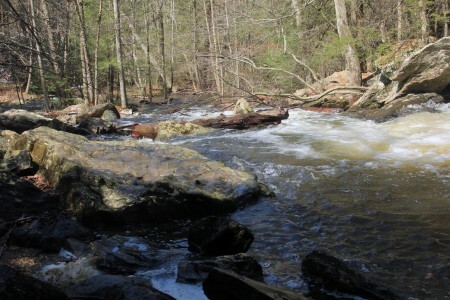 It merges here with the Swift River, and continues its flow into Connecticut. The park is covered with glacial till deposited by the receding glaciers over 15,000 years ago. Following this small stream back to Toby Hill Road and the parking lot revealed many of these ancient wonders, adding to my excitement over this small but interesting wonder of nature. I will return to this interesting part of Connecticut over the summer, starting with Haystack Mountain State Park. 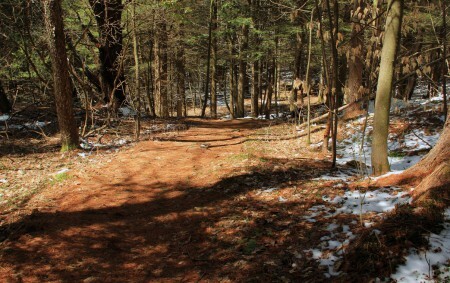 The walk down the yellow blazed trail was smooth at the beginning. 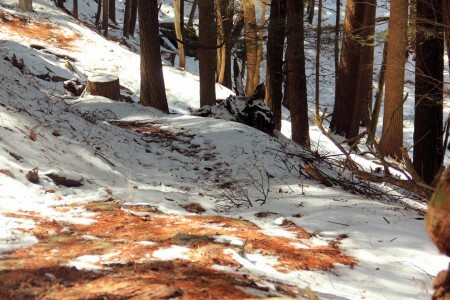 The shallow snow pack and the sudden downhill drop added some hazards on the path to the falls. A concrete marker at the state line, with Massachusetts to the right and Connecticut to the left. The two folks at the top of this photo are standing on the rocks just below the stone bridge at the top of the falls. 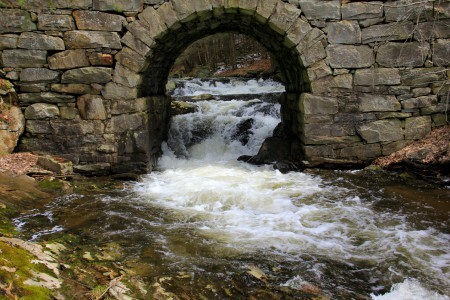 The Whiting River as it flows under the stone arch of the bridge. The river continues under a lava rock overhang on its way to its final plunge. The final plunge begins and continues to the rock gouge below. 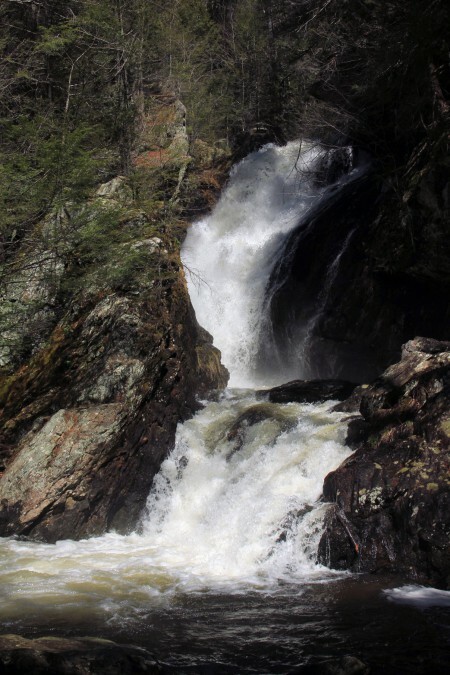 This entry was posted on Sunday, May 4th, 2014 at 12:54 pm	and is filed under New England Waterfalls. You can follow any responses to this entry through the RSS 2.0 feed. Both comments and pings are currently closed.